This iOverlay was placed on top of the beauty videos. 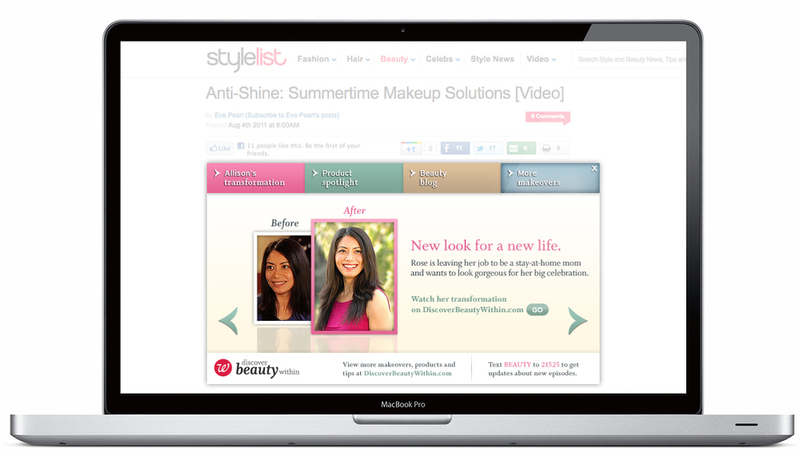 If the consumer rolls over the intro animation, they will see the beauty videos, the product information and the host's blog. These online ads linked to the Discover Beauty Within website. The ads dynamically changed every month with each new episode. The goal was to make Walgreens relevant for consumers during the holiday season. We provided a Pandora page that played holiday music when the user put a Walgreens gift into the stocking. This ad was placed on Yahoo's homepage and linked to Walgreens.com. We wanted to show people the wide variety of gifts Walgreens had to offer for the holidays. Walgreens wanted more people to know about the benefits of their app. This ad let people play a game while their page loaded on their mobile device. The messaging at the end of the game hits on how fast it is to refill with their free app. The full app experience on Facebook from step 1 to step 4. Just a few examples of the scene and gift pairings.